New listingRADLEY RED LEATHER HANDBAG TOTE SHOULDER BAG LARGE!!! Radley Mustard yellow leather Tote style bag, Handbag Bag. Radley Soft Leather Tote Olive/brown. Measures 32cm wide by 18cm High, Handles length is 14 cm. Condition is Used. The outside of the bag has minor scuffs on the sides- see photos but otherwise great condition. Inside there are 3 internal zips. There is a purple pen stain inside one of the compartments towards the bottom of the lining. Comes with dust bag. From pet free and smoke free home Dispatched with Royal Mail 2nd Class. LADIES SMART BLACK LEATHER AND CLOTH 2 HANDLES SLOUCHY TOTE/SHOULDER BAG. Radley authentication patch inside and Radley London embossed on outer leather label. Beautiful bag very lightweight and easy to carry gorgeous Radley palm leaf design. This style is a sold out design no longer available from Radley. Lovely soft leather handbag, complete with pink fabric presentation bag. Excellent condition and hardly used. Approx 30cm x 15cm. With classic Radley leather decoration and dog fob. See photos for full details. Usual Radley high quality. 14 ins x 12 ins 4 ins. ALL IN BRILL CLEAN COND INSIDE AND OUT. MAIN SECTION SECURES WITH FULL ZIP SMALL INNER ZIPPED POCKET AND OPEN POUCH POCKET ON BACK OF BAG. OUTER CANVAS IS WIPE CLEAN & INNER LINING SIMILAR BUT THICKER. RADLEY SOFT BLACK LEATHER TOTE/UNDER ARM BAG.VERY GOOD CONDITION. Condition is Used. Dispatched with Royal Mail 1st Class. New listingRADLEY ROAR MULTI LEATHER TRIM HANDBAG TOTE SHOULDER BAG LARGE!!! NEW!!! RADLEY ROAR MULTI LEATHER TRIM HANDBAG. Look closely at this tote and you will see our iconic Scottie dog jumping around in the design. Water-resistant material. Contrast cord zip pull and hanging Radley dog. Radley Large Leather Tote Work Shopper Bag. Condition is Used. Dispatched with Royal Mail 2nd Class. Lovely dusky pink large Radley bag. Two shoulder straps and zip opening. Inside big roomy bag, corded lining with pockets both sides. There is very minimal wear to this bag, slight rub to leather edge/corner - see photo. Inside in nice clean condition. Bag measures approx 30 x 32 x 9 cm. Comes with cute Radley dog. Very Special Edition Radley "Tribal " hand bag in red leather with beautiful external stitching and fancy zip pulls. 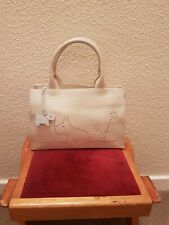 Radley Tote bag Very good condition. Zip pocket and two slip pockets inside. Radley Tote Handbag in beautiful soft light tan leather. Can be worn as a shoulder bag. Width 35cm, height 35cm. Immaculate condition. A Radley Tote Bag, with dust bag, measuring: 10" high; 3.5" deep, expanded; and 14" wide. The Bag features: textile outer with decorative leather, leather handle straps, magnetic open/close main compartment, fully lined inner with 2 internal zipped pockets and 2 pouches and external magnetic close pocket. Please see the description above and the photographs below for details and excellent condition..
RADLEY ROAR MULTI LEATHER TRIM HANDBAG TOTE SHOULDER BAG LARGE!!! NEW!! !